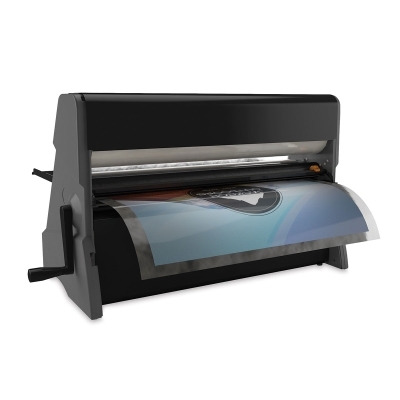 Offering three solutions in one easy-to-use package, the Xyron Pro XM2500 Laminator is a complete professional document finishing system that makes applying adhesive to posters, displays, mockups, banners, signs, advertisements, POP displays, and presentation boards (up to 25" or 64 cm wide) fast and easy. The environmentally friendly XM2500 instantly applies laminate and adhesive without heat or electricity. Simply feed the item into the laminator, turn the handle, and trim. Xyron's aggressive adhesive, coupled with the XM2500's high-pressure rollers, improves both the transfer and bonding quality, while interchangeable roll sets allow for easy application changes and even, edge-to-edge adhesive application.It accommodates documents up to 0.10" (2.5 mm) thick, or foamcore up to 3/16" (4.8 mm) with the tray removed. Weighs 90 lb (41 kg). See the Resources Tab to learn about the benefits of cold lamination. 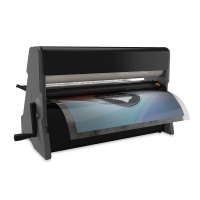 Two-Sided Thermal Print-Sensitive Laminate — This high-gloss film is suitable for use on thermal print-sensitive items. Acid-free. Repositionable Adhesive — This adhesive allows items to be repositioned over and over again. It's easily removable from glass, walls, paper, and most other surfaces. Acid-free. Permanent High-Tack Adhesive — This extremely aggressive adhesive instantly creates a permanent bond on most surfaces. It sets instantly and won't peel. Acid-free. Two-Sided Standard-Use Laminate — This high-gloss film is suitable for use on a variety of substrates. 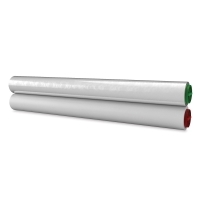 It offers superior adhesion and is compatible with most media. Acid-free. Permanent Standard Adhesive — This moderately aggressive adhesive creates a permanent bond on most surfaces. It can be touched to the surface, peeled back quickly, and placed again. Acid-free. For information about the benefits of cold lamination, please click here.